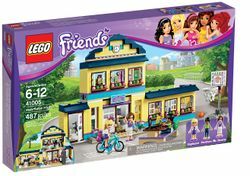 41005 Heartlake High is a LEGO Friends set released in Summer 2013. It consists of a model of Heartlake High, Heartlake City's High School. The interior includes a bathroom, deli, hallway, art studio and science classroom. 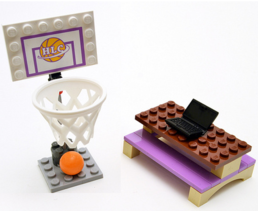 Also included in the set is a basketball hoop, picnic table, and three mini-dolls - Stephanie, her classmate and boyfriend Matthew, and their teacher Ms. Stevens. The school is mainly coloured light yellow, with blue and medium lavender highlights, brown and white windows, and a dark blue roof. Like Olivia's house, the school is modular, so parts of it can easily be rearranged. The set is divided into four main sections: the bathroom, food deli and hallway, science classroom, and art classroom. The set also features a picnic table and basketball hoop outside the school. The set includes three mini-dolls; Stephanie, Matthew and Ms. Stevens, as well as a blue bike for Stephanie to ride. The school has four different sections, the positions of which are interchangeable. 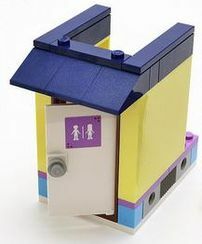 The first section is a bathroom, which sits on a white baseplate. It's blue and lavender at the bottom, though on the right there's two light grey bricks with holes in them, so the bathroom can be connected to the hallway. The bathroom has a brown and white door. Stuck on the door is a purple squared sticker, with a plain white male and female with a white line going through them. The rest of the exterior of the room is light yellow, aside from the dark blue roof. Inside there is a white toilet with a rounded top, and behind it attached to the wall behind it is a grey stud on a dark blue brick with which to "flush" it. The room also contains a sink, which is coloured grey at the bottom, and at the back has a grey tap on a flat dark blue brick. The sink's corners are white. On the left wall is a purple sticker, printed with an image of two cats on a blue background. The second part of the school is the entrance room. It sits on a cream baseplate. On each side of the doorway into the room there are flat grey bricks surrounding a brown piece with a hole in the middle, for flowers to rest in. The flowers have dark grey stems and Light Purple petals. The entrance has brown doors on the exterior with white inside, and the door itself has square windows, and grey studs for handles. On each side of the doors at the bottom there are blue and purple bricks. There is a window on each side of the doorway, and surrounding the windows are long yellow bricks, with flat white tiles on top of them. On top of the doorway are two flat lavender bricks, and in the middle ia a grey brick connected to another flat lavender brick, connected to a white tile brick. The white tile brick has a sticker with "High School" written on it in white over a purple squared semicircle which has a blue background, and a red heart above the words. The exterior of the left and right of the entrance are identical, both have grey bricks with pegs to connect to the rest of the school, beside blue bricks. Both of these have lavender bricks on top with a long, tall light yellow brick on top. On top of the walls of the entrance room are flat dark blue bricks. Inside the entrance room, there is a deli on the left and lockers on the right. There's four lockers at the end of the right hand corner. The lockers are two studs high, and dark grey. The bottom lockers have medium azure stickers. The one on the left has an orange basket ball and lavender spots, the one on the right has "HLH" written in white, also with lavender spots. The lockers on top have Bright Purple stickers. The one on the left yellow stars printed on it, with a yellow and white line, and the one on the right has a similar design but in one of the stars is printed a white S, indicating it's Stephanie's locker. Beside the lockers is a long white bench which sits on two curved bricks. Over the bench is a sticker depicting a blue bulletin board with the school clubs listed on it (featured on the board are a basketball club, soccer club, baking club, science club, magic club, and a sign up sheet for an unknown club). The deli is situated on the left hand side of the room. It sells sandwiches, orange juice and milk. The deli's counter is white, and eight studs long by two studs deep. In the top corner is a grey cash resister, and on top of it a golden coin is situated. At the end is a glass window with a lavender plate on top, that displays the sandwiches behind it. The sandwiches are flat on top and two studs long. The first sandwich is brown and has lime studs on the inside. The second sandwhich is cream-coloured and has a red stud and a lime stud inside it. To the right of the sandwiches is a printed light blue milk carton with a picture of a cow. There is also a printed green orange juice carton with a yellow stud top. There is also a sticker on the wall of a blue carton of milk. The third part of school is a science classroom, which sits on top of the entrance. Like the other sections of the school it is blue and lavender on the bottom, except for the grey sections on the side that allow it to be rearranged with other parts of the building. It has three white windows in brown window panes over brown windowsills. The windowsills have pink, light pink, lime and green flowers on them, the flowers are arranged light pink stud, green flower, lime stud, pink flower. In between the two windowsills are tall light yellow bricks, forming part of the wall. In between the light yellow bricks there are shorter light yellow bricks. On top of the yellow bricks is a dark blue roof. The sides of the science classroom are all composed of long light yellow bricks. On top of the side walls there are dark blue bricks. On the roof and dark blue bricks, there are flat dark blue bricks. Ms. Stevens's desk. A brown owl sits on top of it. Beside the table where the owl sits is a row of cabinets, which are mainly brown, although there is a flat white brick on the front. On top of the first one there is a light pink shelf with pink and brown books in it. On the second cabinet there's a white telescope with black and grey pieces at the end. On the third cabinet is set a conical green flask. The final cabinet features a brick-built lavender microscope. In front of the chalkboard are two desks with chairs. The desks are made out of white pieces on top of a grey square brick. On top of the white brick there is a brown piece with a hole in the middle. The chairs are made of upwards-slanting brown pieces with an azure piece beside a flat one, this repeats behind the second desk. The left wall has an azure and lavender world map sticker stuck to it. The fourth part of the school is an art studio. The exterior is identical to that of the science classroom, see above. Inside of the studio in the right corner there is an art stand, which can be turned around. Its made of a brown turntable, with cream pieces built on top of it. There are cream edges and a white picture of an apple and flowers "painted" onto it. In front of the art stand there's a white and pink stool. A white stool with a pink top is situated in front of a table. The table has a black stand with pink on top of it, and has an orange bowl and a glass of pink and yellow flowers in front of it. To the left of the art stand is a lime cabinet with white drawers and a brown brick on top of it. In each drawer there is a brown paintbrush dipped in green paint. On top of it are triangular jars of paint, in the colours red, green, yellow and blue. There is a white stud on top of each. At the left end there's a black skeleton leg which holds a sheet of music. In front there is yet another white stool with a pink top. The school also includes an outdoor basketball hoop, standing on a light grey baseplate with a darker grey cylinder sitting on it. A light grey TECHNIC piece supports a white basketball net. Behind the net is the backboard, with a sticker that says "HLC" in white over an orange basketball. An orange basketball is also included. In addition, the set also includes a picnic table, for the students to study and eat their lunches on. It is stood on cream arch pieces, with two long purple flat tiles sitting on top of the arches. In the middle of the purple tiles there is a cream brick on each side and on top of it sits a brown table top. On the table top is situated a black laptop. The set includes three mini-doll figures. Stephanie, her boyfriend and classmate Matthew, and their teacher Ms. Stevens. Stephanie is wearing a dark purple skirt over her light nougat legs which lead down to her dark pink shoes. She wears a white blazer with black outing and golden buttons, underneath she wears a purple shirt, and she has white sleeves and light nougat hands. She has a smiling face with her teeth showing, light blue eyes and black eyebrows. She has straight, long blond hair. Matthew wears long dark blue jeans, and cream shoes. He has a green short-sleeve shirt with a collar, and has light brown arms and hands. His light brown head has a smiling expression. He has green eyes, and above them thin black eyebrows. His hair is long, black, and wavy. Ms Stevens has lavender shoes, light nougat legs, and a long white dress. She has a lavender torso with purple trimming. She has bare light nougat arms, pink lips and dark green eyes with grey glasses over them. She has short brown, rounded hair. In the top left corner of the box is the Friends logo with a purple background. Printed on the top right corner are the five friends; Mia, Andrea, Emma, Stephanie, and Olivia. In the middle of the box is a picture of the actual set. The background of the image features a blue sky with cirrus clouds. Also in the background are several colourful houses, and to the left there is a lime-coloured meadow with green bushes and a tree full of green leaves. At the left there's another colourful tree, and behind the tree there's a white gate and a lime soccer field. Superimposed over the left tree are the recommended ages and set number. In the bottom left corner is a rounded picture of the back of the set. In the bottom right corner is all three mini-dolls with their names displayed beneath them. On the back of the box in the centre, there's a large picture of the inside of the set, in front of a lime meadow with Stephanie's bike leaning against an apple tree. Above the meadow there's a plain blue sky. In the top left corner the Friends logo appears again. Underneath the logo is the school assembled in several different ways. To the left of the logo is a picture of the box dumping its contents out in their labelled bags. In the right top corner is a picture of Stephanie beside Olivia's figure disassembled in silhouette. Below that is a set of different scenes of the mini-dolls at school, and a picture of the included accessories. Underneath that is the URL of the official Friends website. In the left bottom corner there's a picture of the five friends with their names printed underneath them. Andrea, Andrew, Christina, Chloe, Danielle, Ella, Emma, Isabella, Jacob, Joanna, Kate, Katharina, Lily, Liza, Maya, Mia, Nicole, Olivia, Robert, Stephanie and Matthew along with several other teenagers attend Heartlake High. Ms. Stevens is the main science and geography teacher, but in the set she works the food deli and teaches in the art studio as well. Classes known are; Art, English, Geography, Home Economics, Math, Music and Science (Biology, Chemistry and Physics). The school also has two toilets(one in the set) and a library. The school's colours are blue and lavender. They're are several clubs and teams in the school. Mia is in the magic club. Olivia is in the science club. Andrea is in both the drama and music clubs. Andrea also does the baking club along with Stephanie. Matthew plays for the school's male basket ball team. Stephanie, Mia and at least 5 other pupils play for the school's soccer team. Emma appears to be a cheerleader. Kate is the school mascot-a giant bumble bee. This set was nominated for the Girl Toy of the Year in the 2014 Toy of the Year Awards. This is a description taken from LEGO.com. Please do not modify it. 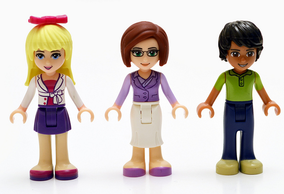 (visit this item's product page) Head to class with the LEGO® Friends! Facts about "41005 Heartlake High"
This page was last edited on 15 March 2016, at 05:41.